Burma’s silence in response to a UN tribunal ruling on the decades-old sea territories dispute with Bangladesh perhaps underlines the fact that the country has lost out on what could be a rich vein of natural gas. Exploration licenses awarded by the state Myanmar Oil and Gas Enterprise (MOGE) in 2008 to companies from China and South Korea will now have to be abandoned because the beneath-the-sea territory they were licensed to exploit has been awarded to Bangladesh. It means ConocoPhillips Inc of the United States and not Daewoo International Corporation of South Korea can now legally drill for gas off the south coast of St Martin’s Island, which is only 20 km or so from the mainland where the Naaf River flowing into the bay forms the land border between the two countries. The island is about 70 km south of Cox’s Bazar. Daewoo was at the center of a naval confrontation between the two countries in November 2008 which finally led to the dispute going before the International Tribunal for the Law of the Sea (ITLOS) in Hamburg, Germany. The South Koreans, under Burmese navy guard, went ahead with an expensive drilling operation in the area designated Block AD-7 by MOGE, but they were forced to withdraw after Bangladesh sent its navy to challenge the work. The sovereignty of St. Martin’s, a coral island that is home to several dozen fishing families, has never been in doubt. It belongs to Bangladesh. But the two countries have long argued over ownership of the seas around it. In its arbitration on March 14, the ITLOS extended Bangladesh’s sea territorial boundary south of the island in what it termed a delimiting judgment in line with standard offshore rights. This and other adjustments mean that Bangladesh has acquired about 4,000 square kilometers more sea territory that it had before. “The tribunal said it had reached a compromise but the fact is that Bangladesh gains access to potentially rich gas stock,” Bangkok energy industries consultant Collin Reynolds told The Irrawaddy on March 17. “The Burmese energy authority [MOGE] had awarded exploration licenses to Daewoo and Kogas, another Korean operator, and other firms for zones now legally established as Bangladeshi territory. It extends the area which ConocoPhillips had been licensed by Bangladesh to explore. “What this [tribunal] ruling does achieve, however, is stability through legal certainties which will benefit both countries because there will be no hesitation now by reputable big oil and gas companies to take on new exploration licenses. The territorial dispute had deterred a number of potential investors because of the uncertainty of ownership and legality. A pointer to that potential is the rich vein of gas already found and about to be tapped in Burma’s Shwe field, which is only a few kilometers south of the new international boundary. Several more blocks of the Shwe field inside Burmese territorial waters have still to be explored. Just two blocks of the Shwe field, being developed by Daewoo and two Indian state-owned partners, GAIL Limited and onGC Videsh, have confirmed gas reserves of at least 200 billion cubic meters. Most of this gas is to be exported to China via a new pipeline being built in a controversial deal made in secret by the former military regime. Its value to Burma’s state coffers remains unknown. Meanwhile, Singapore energy firm MPRL disclosed last week that it has begun drilling in the A-6 Block in Burmese waters of the Bay about 200 km south of the Shwe field. MPRL is a consortium of private investors, including the US firm Baker Hughes Solutions Inc, in partnership with MOGE. ConocoPhillips is now expected to be awarded extra territory around St. Martin’s Island by Bangladesh’s state-owned oil firm PetroBangla as a result of the tribunal ruling, said the international energy magazine Platts. In addition, two or three new deep-water exploration sites could be offered in the April licensing round. The Bangladeshi Energy Ministry has ruled that any gas or oil found by ConocoPhillips must not be exported, said Platts. Bangladesh’s main energy source is gas but limited supplies have caused severe power shortages which have seriously damaged the country’s garment manufacturing industry. These guys used to make quick money bashing Myanmar,using the direct translation of the official country name in Myanmar language since independence in 1948, accepted by all at that time in Myanmar language - or Burma,using the translation since colonial times. A major US newspaper has recently written that these guys need career counselling now. You are being a fictional news writer now? Even though Burma did not win her claims around St Martin Island, it didn't lose its present territory. You are also confused with Burma's gas block AD7 and Bangladesh's gas block #10. They are both retained respectively. And you ignore Bangla political pandering. 1974 agreement was scrapped "in favor of Burma". So Burma have more base line to be awarded more EEZ area. As a result, Burma get 171,832 square kilometres whereas Bengali get 111,631 square kilometres. 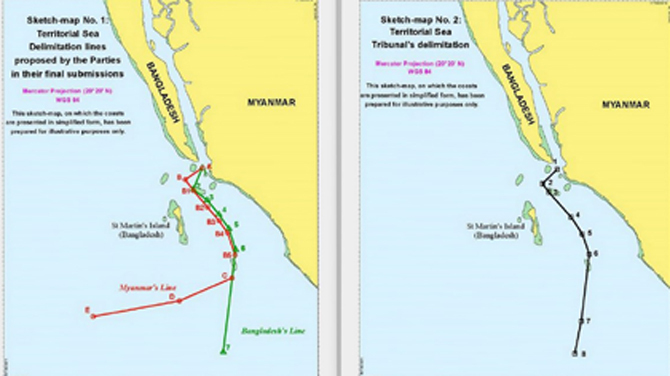 So Bangladesh did not really get whatever they asked for...except previously unsettled area around St Martin's Island.